The Anahulu Stream is a good, all American stream. Kids jumping off the bridge or swinging off rope swings or just swimming around remind you what fun streams can be. It is a clean, beautiful, lush river, and sets the stage for our North Shore lessons. 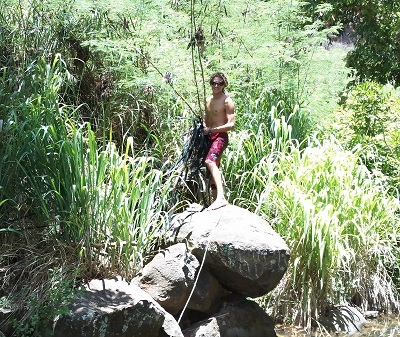 For one and a half years, we have sponsored monthly clean ups of the bank of the Anahulu stream. In recent years, before we began teaching paddling, the river was used very infrequently by outrigger canoe clubs and crabbers. We restored it to its past beauty and cleared the banks so well that we got to a point where there was nothing left to clean. When we’re just hanging around at the beach between lessons, we’re picking up litter to keep the shore clean. It’s a good feeling. The river and the shoreline’s cleanliness and beauty is being enjoyed by plenty of people. And with the recent heavy rainfall and floods, we were back again to do a little clean-up. Some fish netting, hose, a couple of plastic bags later, and the stream is once again back to beautiful. It’s our way of giving thanks to the river and the land we love.